Classic design with durable metal construction and shiny brass finish.Precision crafted from brass with a leather wrap.Collapsible eyepiece for compact storage.A very small volume and weight with fine finish, very convenient to carry. ✘Keep the scope folded and stored when you don't use it. ✘Pull the Barlow all the way out. ✘Point the objective lens to the object and look through from eyepiece. Slightly push the barlow in for focusing until you can see the object. Sometimes it is necessary to pull a bit out ward again if you have pushed too much in. By pushing and pulling the barlow bit by bit, the image will be visible gradually. ✘With slow and tiny motion, rotate the eyepiece bit by bit to push and pull the barlow so as to reach a sharp image. Note: The motion for micro-adjustment of focus must be made slowly bit by bit. **Place your order now and buy with confidence.If you have any problem with our products ,please contact us by email or ask the question on the product page.We will try our best to solve your problem! ✘Fine Quality and Exquisite - The spyglass is classically designed with durable aluminum alloy plating gold and handle part is covered with premium leather. It also package with a leatherette case! 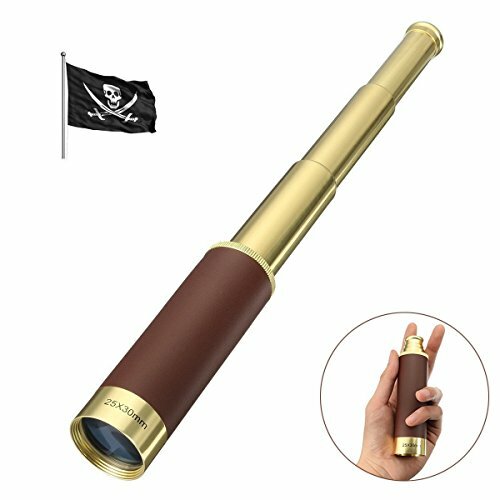 ✘25x30 High Power Magnification-It is not just a toy！The hand-held Collapsible Captain's Brass Spyglass, with 25x magnification can reach a field of view of 270ft at 1000yd, bringing a sharper and broader view to you. ✘Compact and Focusable-The Spyglass is telescopic,you can contract the lenght to 13.5 cm, and only weight 213g.It is so lightweight and compact that you can take it with you anywhere. Stretch the spyglass body slightly to focuse,you can find the beautiful scenes easily. ✘A Cool Spyglass for Gift -Perfect as a gift for kids to realize their captain's dream and explore the world, and a great addition to your maritime or Captain or Pirate collection. ✘100% Satisfaction Guarantee - We are so confident you will love SGODDE Collapsible Captain's Brass Spyglass that we offer 60 days Money Back Guarantee with one year warranty!